Calton Hill rises beyond the east end of Princes Street and carries a rather eccentric collection of buildings and monuments. 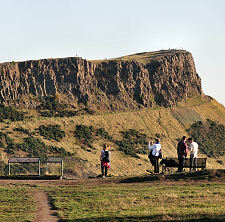 Its principal attraction is the superb panoramic view, taking in pretty much the whole of Edinburgh. 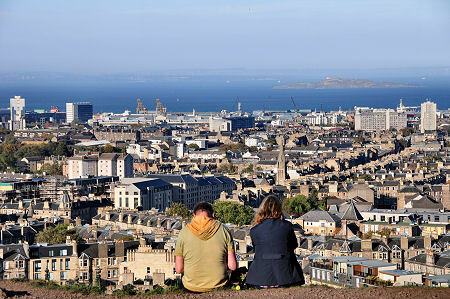 Robert Louis Stevenson said that Calton Hill was the best viewpoint in the city as from it you could see both Edinburgh Castle and Arthur's Seat, something you couldn't from either of them. 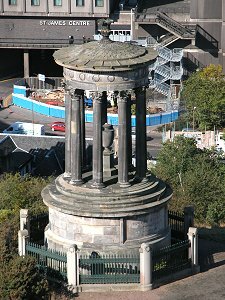 If the views from the top of Calton Hill are superb, they are still better if you climb the 143 spiral stairs to the top of the Nelson Monument, built in 1807 as a stone imitation of Nelson's telescope. From here you can see a large chunk of Scotland. To the east, highlights include Bass Rock and North Berwick Law. Views to the south are most constrained, but still superb. 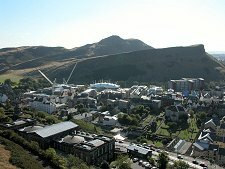 Salisbury Crags and Arthur's Seat dominate everything, but below them are the Palace of Holyroodhouse, the white armadillo of Our Dynamic Earth, and the Scottish Parliament. Views to the north include a long stretch of Fife's coast and the Forth Estuary including the island of Inchkeith. Moving closer you see Leith docks and town, with North Edinburgh further to the west. 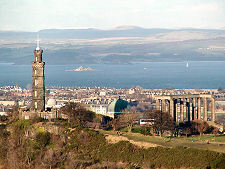 Still closer, the Nelson Monument offers the best view of the various structures on the top of Calton Hill itself. 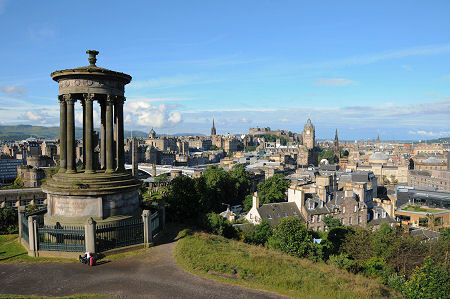 The largest is the 1818 City Observatory, with the 1776 Observatory House at one corner and the Playfair Monument at another. The observatory was intended principally to take accurate measurements of time. 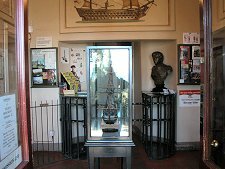 These were first conveyed to the citizens of Edinburgh and the mariners of Leith by what was known as a "politician's" clock (because it had two faces). 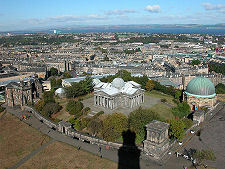 Later the Observatory was connected to a time signal erected on the top of the Nelson Monument itself. The large white time-ball drops precisely at 12 noon Greenwich Mean Time on week-days. This equates to 1pm during British Summer Time, so for half the year its dropping coincides with the firing of the one o'clock gun from Edinburgh Castle. 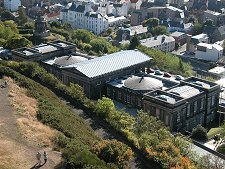 Indeed for many years the Observatory was connected by a 4,000ft electric wire stretched high across the city to the Castle to ensure the one o'clock gun kept precisely to time. 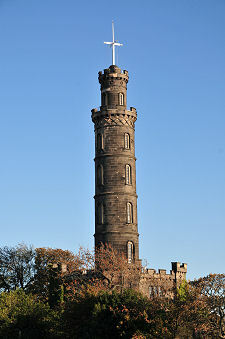 Nearby is the Dugald Stewart Monument, built in 1831 by the architect William Henry Playfair. 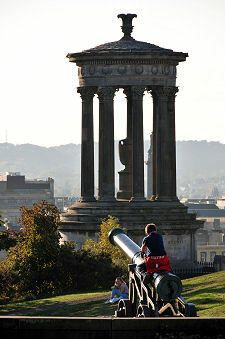 Perhaps the oddest of the structures on top of Calton Hill is the National Monument. 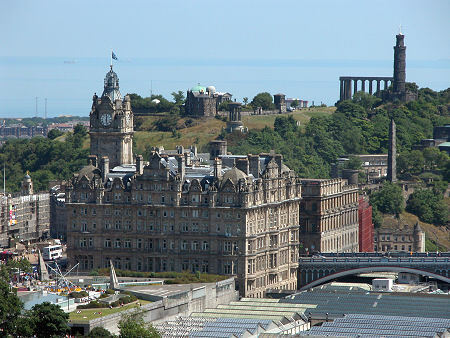 Edinburgh had long been referred to as "The Athens of the North", usually ironically. 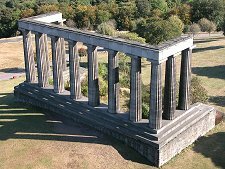 To commemorate the fallen of the Napoleonic Wars it was decided to make Edinburgh's resemblance to Athens a literal one by building a replica of the Parthenon here. Work began in 1826 and ended when the money ran out in 1829, leaving the facade you see today. Some suggest that this was all that was intended, but it seems more likely that the original grand design had been for a complete replica, including catacombs and a church in the form of a temple. 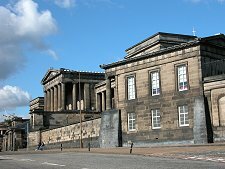 But if nothing else the National Monument served as a style icon copied by many who followed in Edinburgh, with the result that there is no longer any irony in a comparison of the city's architecture with that of Athens. Views west from the Nelson Monument are magnificent. Below you, Princes Street stretches directly away into the middle distance, appearing to conclude with the triple spires of St Mary's Episcopal Cathedral. Beyond is the long ridge of Corstorphine Hill and beyond that the open countryside of West Lothian, extending as far as Cairnpapple Hill. 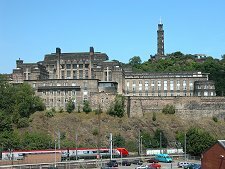 Much nearer at hand is the imposing bulk of St Andrew's House built in the 1930s, complete with the neighbouring 1817 castellated Governor's House, all that now remains of Old Calton Gaol, once the biggest in Edinburgh. 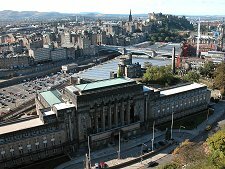 The valley beyond St Andrew's House is filled by the ridged glass roof of Waverley Station, punctuated by North Bridge which carries traffic above it. And beyond again are the closely packed tall stone tenements that comprise this face of the Old Town of Edinburgh. These slowly rise along the line of the Royal Mile until they reach their conclusion at the highlight of this - or any - view of the city, Edinburgh Castle. 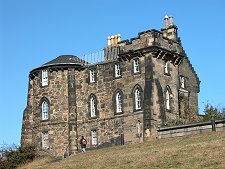 Robert Louis Stevenson's 1897 observations on Calton Hill in Edinburgh: Picturesque Notes can be read here.